Hello and welcome back to another update of Forgotten Hope. The holiday season is finally upon us all, and we hope everyone is enjoying their time with their loved ones. From our family to yours, we at the development team would like to wish everyone a very, very happy holiday! 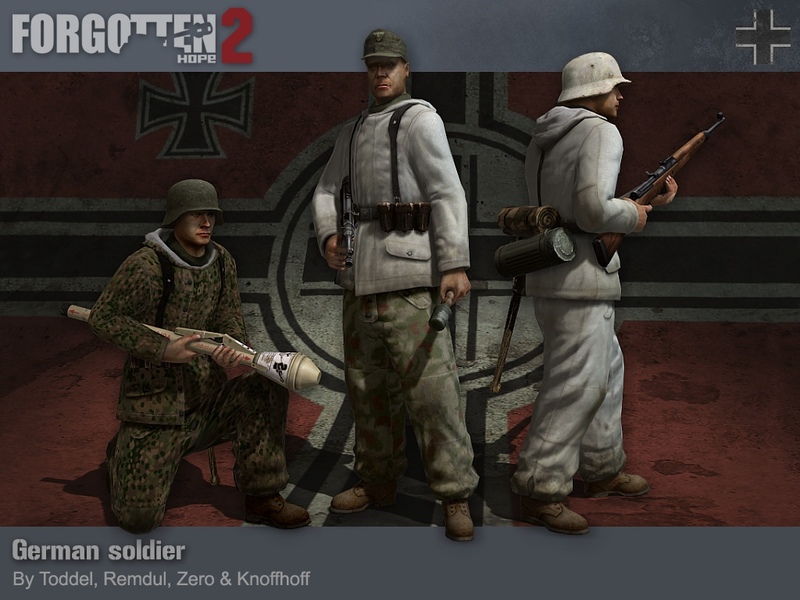 Before we get to today's update, we would like to announce that Forgotten Hope 2 took first place in the Players Choice - Mod of the Year competition for 2010! This comes as a very welcome surprise to all of us here on the development team, and we would all like to personally extend a big 'thank you' to all who voted. Without our loyal fans, this mod would would not be near what it is today, and for that, we are all thankful. As promised, a special announcement will now be made. Stay tuned in the coming weeks to find out exactly what's in store! And now, in honor of the holiday season, today we are showing off the German player models, complete with their new winter clothing for the European snows. By the time of the Battle of the Bulge, the German Army was already experienced in winter warfare, thanks to the experience gained from combat on the Eastern Front. The offensive originally called for 45 divisions, but the defensive needs of the Ostfront meant that only 30 divisions could actually be used. Amongst the newly formed divisions were Volksgrenadier units, which were comprised mostly of battle-hardened veterans and new recruits, thought to be too young or too old to fight. These new units however, severely depleted the last of the reserves of the German Heer. The Battle of the Bulge was the last major German offensive and in total, approximately 200,000 to 500,000 men were committed to the fight, with 67,200 to 100,000 casualties. 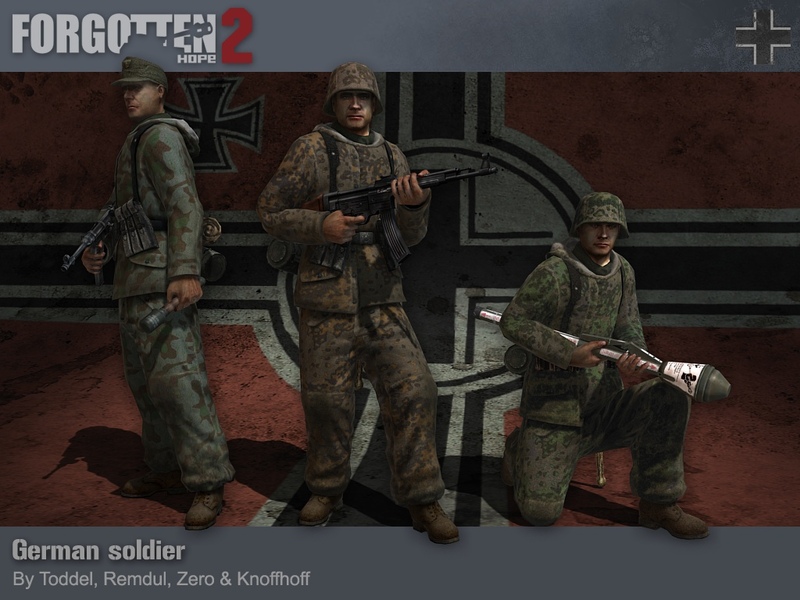 The German winter player models were done by Toddel, Remdul, Zero, and Knoffhoff. That's all for this week, but be sure to come back next time for another update. Until then, feel free to visit our IRC channel and our public forums. Hello and welcome back to another update of Forgotten Hope. Today we have for you two more German weapons of war: one big, and one small. But before that, we'd like to make a few quick announcements relating to the MOTY competition. While the results of the Player's Choice - 'Mod of the Year' awards are still unknown, we are happy to announce that FH2 was one of five mods, and the ONLY Battlefield 2 mod to be nominated for the Editor's Choice - Best Mutliplayer Mod award. 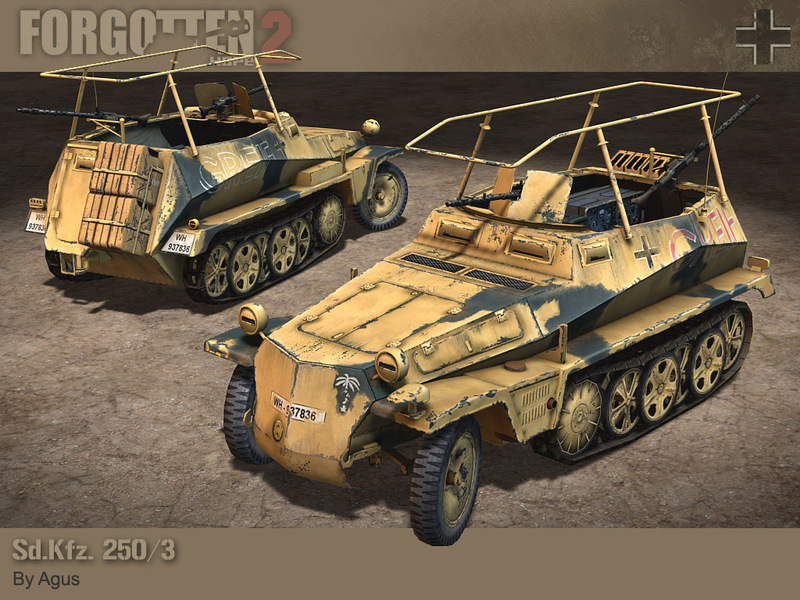 Now, for our first item, we have a brand new German halftrack; the Sd.Kfz. 250/3! The Sd.Kfz. 250 was a lightly armored, open-top halftrack, similar in appearance to the well-known Hanomag halftrack. It was designed and built to accompany tanks into battle, and serve as an observation vehicle, a mobile command post, or an ammunition carrier amongst other things. Although it was adopted in 1939, the 250 did not enter service until 1941 due to production delays. When it did see combat, the Sd.Kfz. 250 was equipped with 1-2 Mg34 machine guns, and was used primarily to carry squads of scouts into battle. In FH2, the 250/3 will be used in its most famous role, as Rommel's personal command vehicle in North Africa. The The Sd.Kfz. 250 was made by Agus. 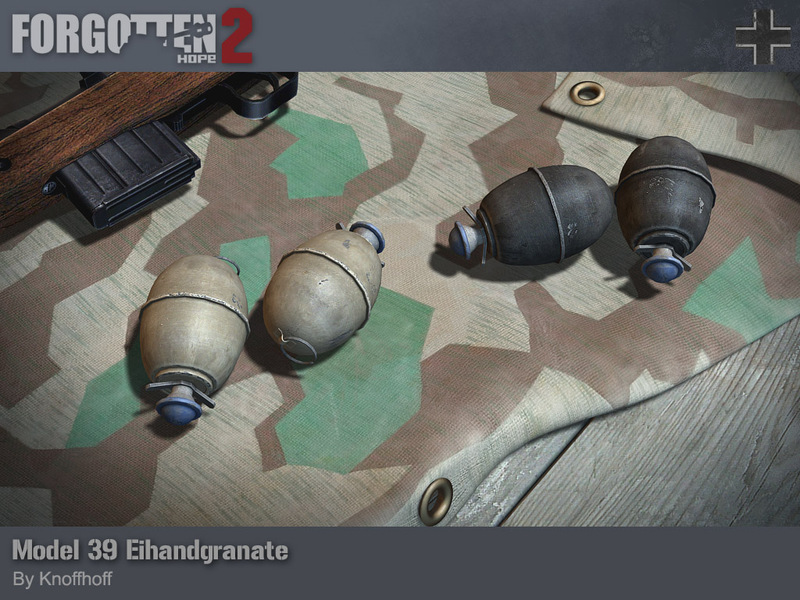 Up next we have another new German hand weapon; the Model 39 Eihandgranate hand grenade! The German Model 39 Eihandgranate (egg hand grenade) was a small, egg-shaped grenade that was produced through the entirety of World War II. The color of the dome-shaped cap indicated the fuse used on the concussion-style grenade. The standard fuse had a delay of four seconds, but the Model 39 could also be used as a booby-trap grenade. One way to do this was to tie it to a door, and use an instantaneous fuse. When the door was kicked open, it would explode. The Model 39 Eihandgranate was made by Knoffhoff. Hello and welcome back to another update of Forgotten Hope. Today we have a some more news regarding the Mod of the Year contest and a new German tank-destroyer. Before we get to the actual update, we would like to let everyone know that Phase 2 of voting for the Mod of the Year contest has officially started, with 8 days left to vote. We hope everyone will take the time to log in and vote for Forgotten Hope 2. At this time, we are happy to announce that the only two Battlefield 2 mods in the contest hold nearly 5% of the total votes. And remember, help make FH2 one of the top 10 mods of this year, and a special announcement will be posted as a reward. Today we are showing off the Sd.Kfz. 162/1, otherwise known as the Jagdpanzer IV/70 (or Guderian's duck by its crews), which comes to FH2 from the original Forgotten Hope mod. The Jagdpanzer IV was a German tank-destroyer built on the chassis of a Panzer IV. It was designed and built against the wishes of Heinz Guderian, who argued that the vehicle took away precious resources from the Panzer IV line of tanks. The Jagdpanzer was armed with a 75mm Pak 42 L/70, a slightly modified version of the Panther's 75mm KwK 42 L/70. Combined with its heavy frontal armor however, it was rather nose heavy and difficult to operate in rough terrain. In combat, the Jagdpanzer performed exceptionally well in its intended role in Normandy, the Battle of the Bulge and on the Eastern Front. However, when it was used as a replacement for tanks and assault guns, the Jagdpanzer suffered in combat. The Sd.Kfz. 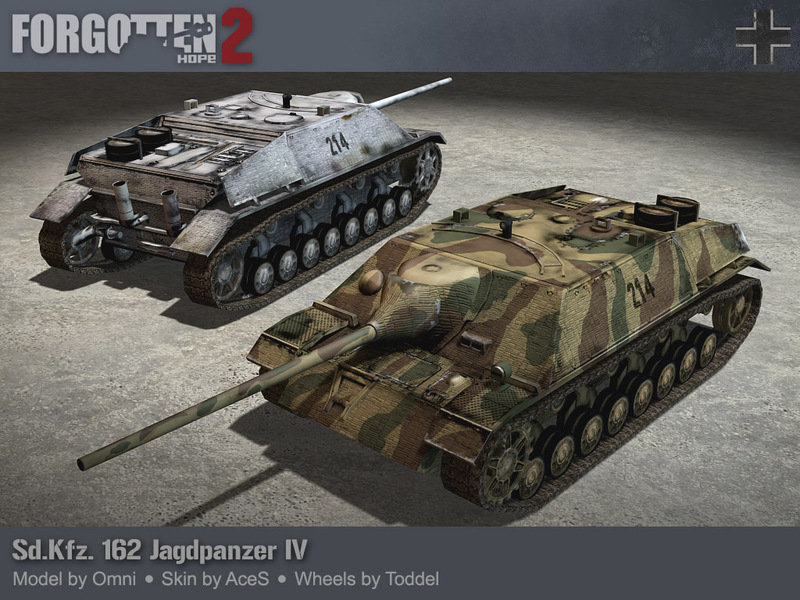 162/1 Jagdpanzer IV/70 was modeled by Omni, with the texture done by AceS, and the wheels done by Toddel.